Well, we did it! College drop off is complete. My daughter's dorm room is decorated and classes started today, so the very first fall semester is officially underway. One of the things I was looking forward to on move in day was decorating the dorm room. We had fun looking for ideas to increase storage in a tiny space. 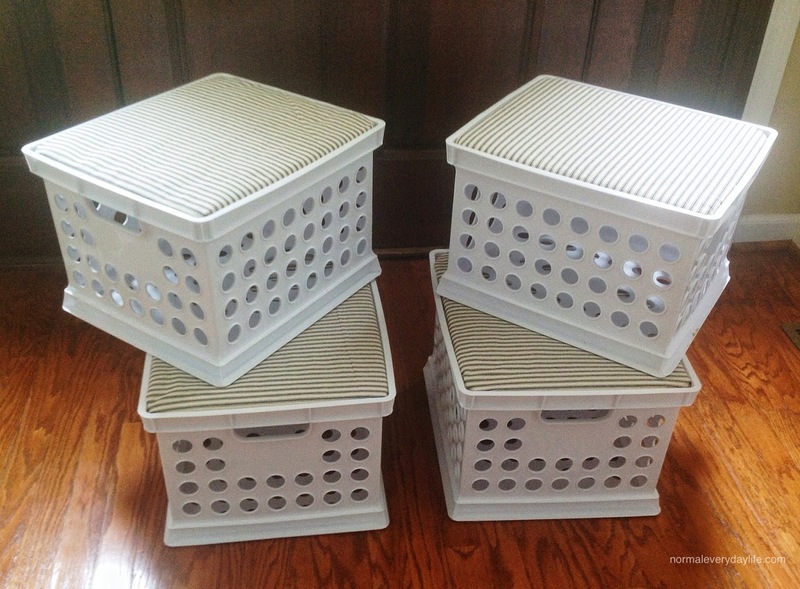 One of best ideas we found was making these little seats out of milk crates. Not only do they provide extra storage and a place for friends to sit, but they also fit neatly under her bed. I saw the idea for these here. They're pretty self explanatory from the picture. All that was required was milk crates, plywood, quilt batting, material, and a staple gun. After cutting the plywood to fit the the top of the crate, you staple batting and material around it to create a cushioned seat. The tops then lift out for quick access to whatever you choose to store inside. 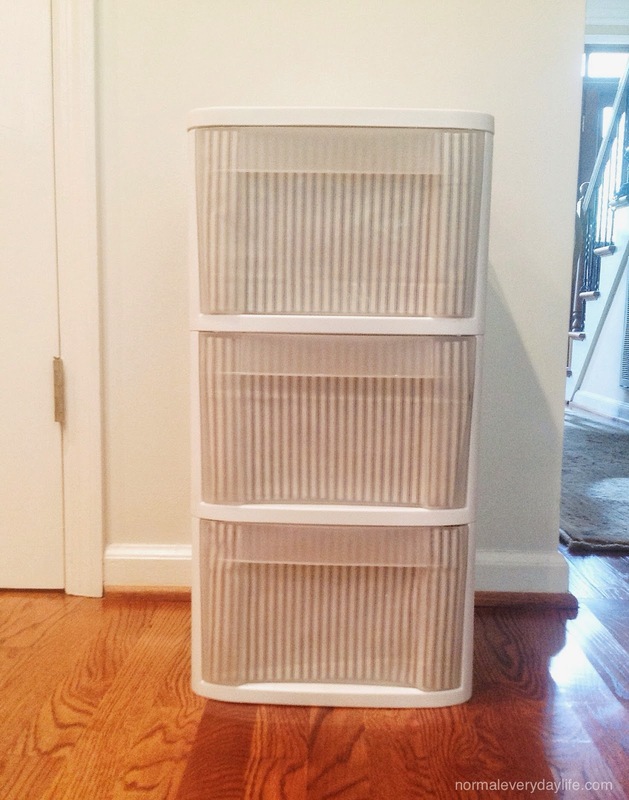 After I put these together, I used the extra material to decorate one of these plastic drawer units. Using a hot glue gun, I attached material to each of the inside front panels. Now she can put whatever she wants in there and no one can see the contents from the outside. My younger daughters liked both of these projects so much they want me to make the same things for their room! Just for fun, here was our view of the dorm room when we first walked in. I couldn't help feeling it had the air of a prison cell. This is her side looking in from the doorway. Two desks face each other and serve to divide the room. And here is an after picture. Much better! That after shot looks a lot better! Great thinking adding the rug. Those floors really do make you think of prison. Or the school cafeteria. Wow...what a transformation! I always laugh at dorm room commercials on tv, where everyone has a massive space. 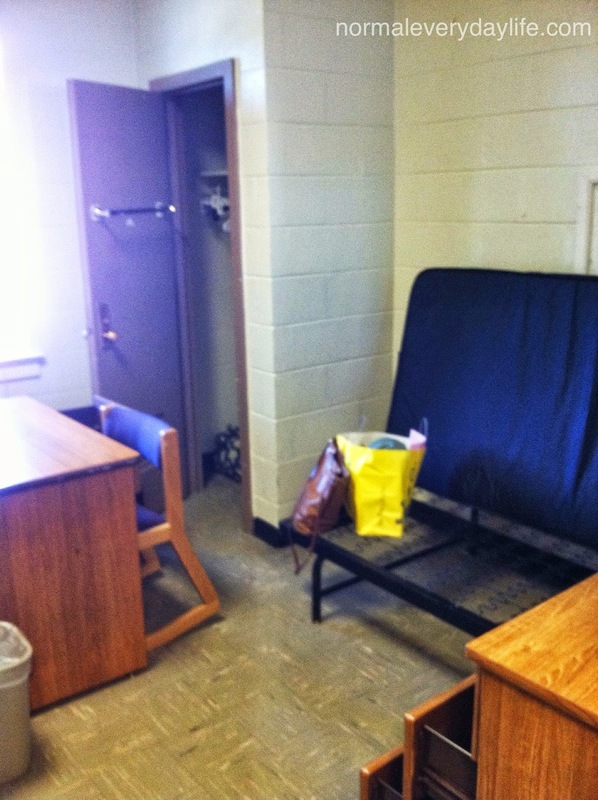 I remember how small my dorm room was in college, but I loved it. Great job on the storage benches! Great job, mama! Those crate seats were super popular when I was teaching elementary. I am glad to see they are still being used. Also, you are so brave to be focusing on the fun instead of wallowing in the sad. You are inspiring! ha ha ha. I can see my husband complaining about the same thing. Think of this way - you'll be experts by the end of it! :) Her room looks great! Thanks, Chelsea! My dad still tells stories of carrying cinder blocks up multiple flights of stairs in the August heat to move us all into dorms! Thanks, Emily! Preparing and getting her ready was fun and gave my mind something other than the goodbye to think about! these are a great idea. I hope she has a great first day. Her room is so cute, I love her bed. Happy tuesday! I LOVE seeing the before and after photo of your daughter's dorm room. And I couldn't agree more . . . they do look like a prison cell. The area rug really adds a touch of comfort to the otherwise cold floor! Thanks, Suzanne! It was fun and it made me happy to leave her looking so comfortable! The throw rug makes such a difference - you did a great job making the room cozy. I hope your daughter is settling in, and that you are doing okay too. 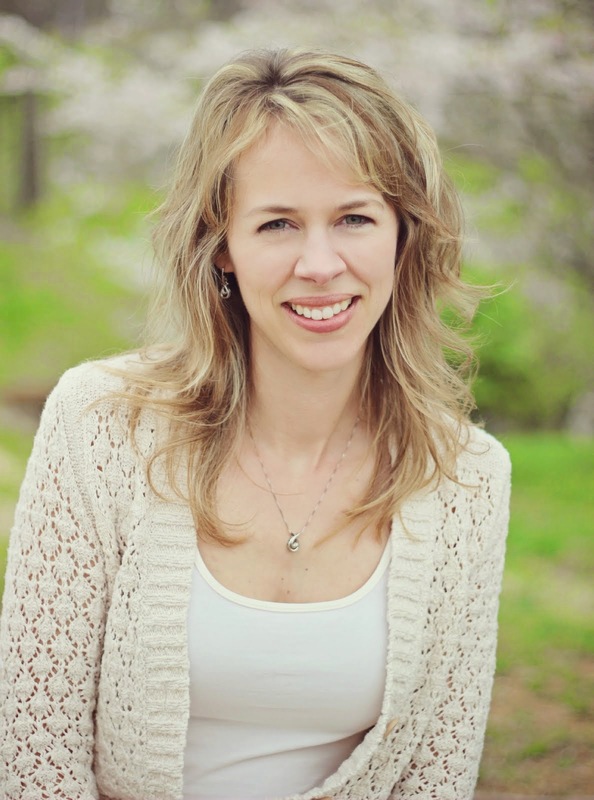 Twenty times to move kids into dorms? Sheesh. That sounds really fun! I'd be looking forward to organizing and decorating it, too! OOh some great storage ideas there that I may have to copy! We seriously need to do some sorting out, especially in the kids room - the toys are literally taking over. Oh, I hadn't even thought about how many dorm rooms I'm going to have to help move into!!! Those crates are awesome and I think maybe even I could pull that one off. Looking forward to hearing how the first few weeks go for your daughter. It sounds like, with your help, she's off to a great start! Thanks, Heather! They were really easy to make! I love that after-shot! It has such a cozy feel to it. I'm glad you think so, Celeste! I felt better leaving her with a homey looking room! I hope they work for you, Sara! Can't wait to see what you do with your new house. Cute! I lived in quite a number of dorms during college. It was always so much fun decorating. I live in Louisiana so in the fall and spring, I stayed in the dorms with no A/C but had a semi-private bathroom with a tub. In the summer, I stayed in the dorms with A/C with community showers. Still was a good time all around. You did a great job. Wow! You worked a miracle on the dorm room! I wish I had some of your talent with small spaces. Thanks for the inspiration and post. Great Ideas! Love the fact that they double as little seats! Thanks, Krissy! I'm interested to see how much she uses them! Oh my goodness, did it EVER look like a jail cell! Eeek! You ladies did a fabulous job. The throw rug was definitely a necessity! Love the milk crate seats too - so cute. Big step, but she's doing great! It was a lot of fun to get her settled. Wow! Those Before & After photos are awesome! 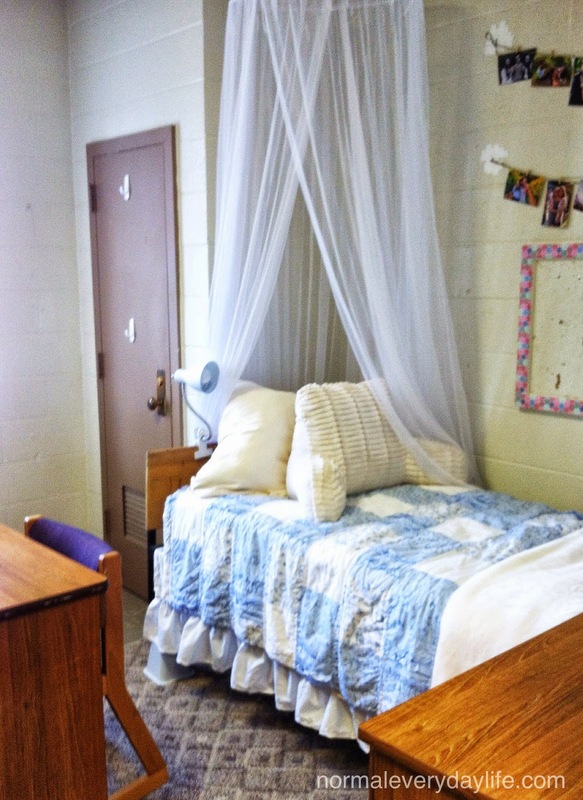 You did a really great job of taking a drab dorm room and giving it a touch of home and personality. My son is so anti-decor I didn't get to really have that fun with him. The most he wanted was a 'fuzzy' blanket...LOL Perhaps when my daughters get there we can have a bit more fun (of course that is far far away...thank goodness...LOL). Haha, My next child to go to college is a boy and already know he won't care about decorating the room either! I'm glad you at least got to help your son pick out his blanket. There's something about leaving them comfortable that makes it a little easier! Good job decorating. I agree that the after shot is impressive. Wow, I would have burst into tears at seeing the first shot! Nice work! Super job! I wish I could have you come over to my house! I bet that Mom's touch will make her feel a little closer to home when the home-sickness starts! Blessings!